Why? 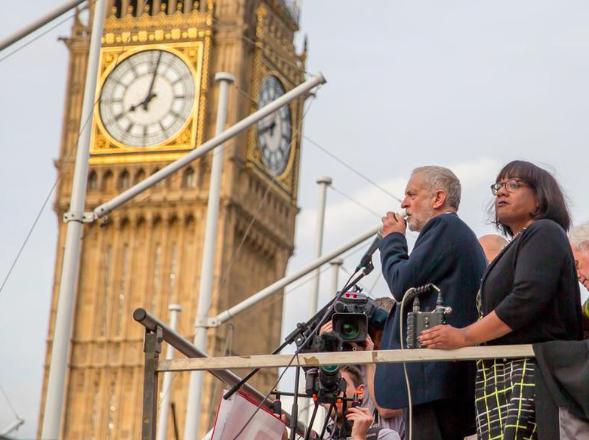 We've offered an alternative to austerity and have refused to pander to racism, writes Diane Abbott. Not only is Corbyn leaping ahead in the polls and encouraging a mass exodus of members into the party, he’s also bucking the trend in Europe where voters are moving away from social democratic parties. The mood at this year’s Labour conference was decidedly euphoric. Pleasure at our unexpectedly good general election performance was enhanced by the fact that so many people (including some Labour MPs) predicted that Jeremy Corbyn would lead Labour to electoral disaster. Instead, the opposite was the case. Corbyn’s politics saved Labour from the electoral disasters that befell our sister parties in this year’s elections. 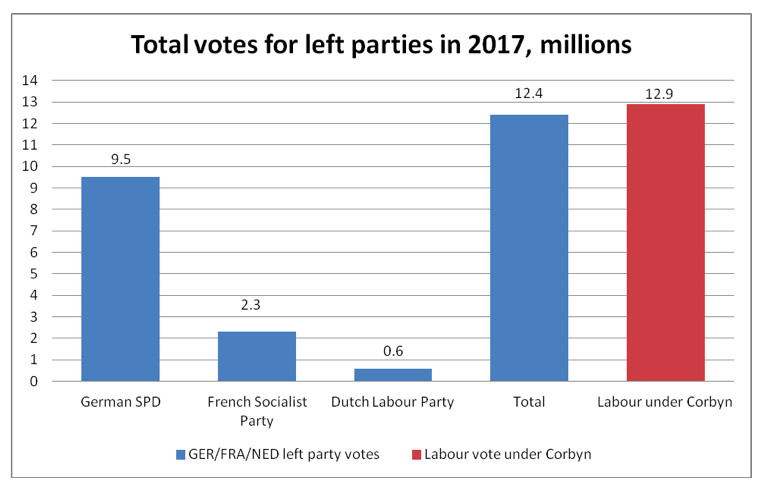 The chart below shows the respective votes for the traditional parties of the left in Europe in 2017 general elections. In the Netherlands, in France and in Germany the social democratic parties of the traditional left received a drubbing. Labour under Corbyn got more than all their votes combined. The French and Dutch parties both received just 6 per cent of the total votes cast. The SPD in Germany did better but gained only a little over 20 per cent – its worst showing in the post-World War II era. The striking fact is that under Labour Jeremy Corbyn received more votes than these parties combined, 12.9 million votes compared to their combined total of 12.4 million votes. The leadership of the Dutch, French and German left parties is not anti-austerity, unlike the Corbyn leadership of the Labour Party. They do not support the economic alternative of investment-led growth and were content to implement austerity measures. In addition, where there has been scapegoating of minorities, migrants, black people and Muslims for the crisis, the European social democrats often did not resist and sometimes participated in it. This is clearly wrong in principle. But for those even now telling us we must shift rightwards to win, there is a deadly riposte. 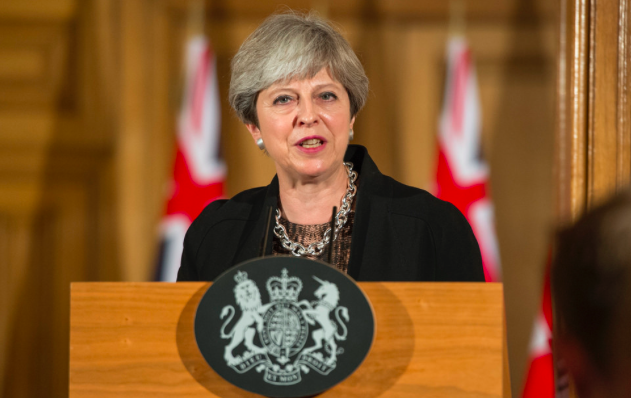 This rightwards leap on racism and immigration, which would have shamed left leaders of earlier generations, was wholly counter-productive even in electoral terms for the European parties. It boosted the arguments of the right and their vote rose as a result. The left vote slumped. It didn’t gain ground. Hopefully, there will be some painful rethinking in Labour’s sister parties. Harsh lessons need to be learnt. For our part, Labour needs to build on its stunning advance at this year’s general election. Lots of work needs to be done to prepare for the next election and prepare for government. But we have laid strong foundations. It is widely recognised that Labour’s manifesto was a great success. Labour is a party in favour of prosperity through investment, not poverty via austerity. It is also a party of equality and no conceding to racism. We will build on these successes. I think the 10% rate of unemployment and the imposition of an arbitary 3% deficit had more to do with Hollande’s unpopularity than a reasonable 60% rate of tax for very high earners – would you prefer a 25% rate of VAT? Anyway Mr Duckington misses the point. Being the “me too”, austerity lite party did not do us much good in 2010 and 2015. 2017 was a break through with a radical manifesto. Incidently unlike 2017 the 2015 manifesto could not bring itself to even mention the phrase council or social housing. Everything was affordable! The title on that graph needs to be clearer that it’s talking about ONLY left-wing parties in the PES /S&D. Germany’s Die Linke (Literally, THE LEFT) and Die Gruene (Centre-left) got over 4 million votes each, which means the German bar on the graph would be up at 17 million and more. The writer should stop pandering to racism. Or rather stop being a racist all together. Oh, and stop being a sanctimonious hypocrite as well.